In February of 2014, I released my first pattern for sale and was rewarded by an actual sale within a day. (In fact, I seem to recall it was within twelve hours.) There was no marketing campaign for that item — apart from this blog — and the pattern was not tested by anyone. Approximately three months later, I released the Hot Hues Convertible Crossbody Fooler Bag, my first pattern for a purse. For this one, I called out for pattern testers to give the instructions a whirl. In actuality, only one of my testers really included the key concept behind the bag in her testing (i.e., the idea of the interchangeable flaps as shown in the picture here), but I am still grateful for the participation that allowed me to launch my second pattern for sale. I fully comprehend that with the number of freebies out there, no one really needs to pay "real money" for PDF patterns. So when someone does, it is an honour. Today, I want to show off a couple of Hot Hues bags that my customers have made. Ironically, both crafters are named Susan. This first one here is by Susan G., who said that she LOVES LOVES LOVES her little bag... apparently she put a lining into it as well. (More on that later.) I thought that her choice of the striped fabric added an interesting aspect to the bag. Need I say that I LOVE, LOVE, LOVE this fabric? It definitely speaks to me! Back to my reference about a lining that Susan G. put into her bag. The original intent of this bag — for those who don't know — was to create a set of pockets for times when you don't have pockets. Therefore, the two zippered pockets on either side are the only ways to access the inside of the bag. There is no top opening under the flap. Several months ago, a purchaser emailed me to express her disappointment in the discovery that the top did not open. We quickly worked it out to the satisfaction of both parties, but it made me wonder why anyone thinks it's a necessity to have an opening at the top seam. Like really, why?? I mean, haven't we all seen patterns for multi-zip pouch-y sort of things featuring a series of stacked zippered compartments like this? Or, more to the point, one of my early projects was this thing, which is hardly original... it doesn't open right across the top either. 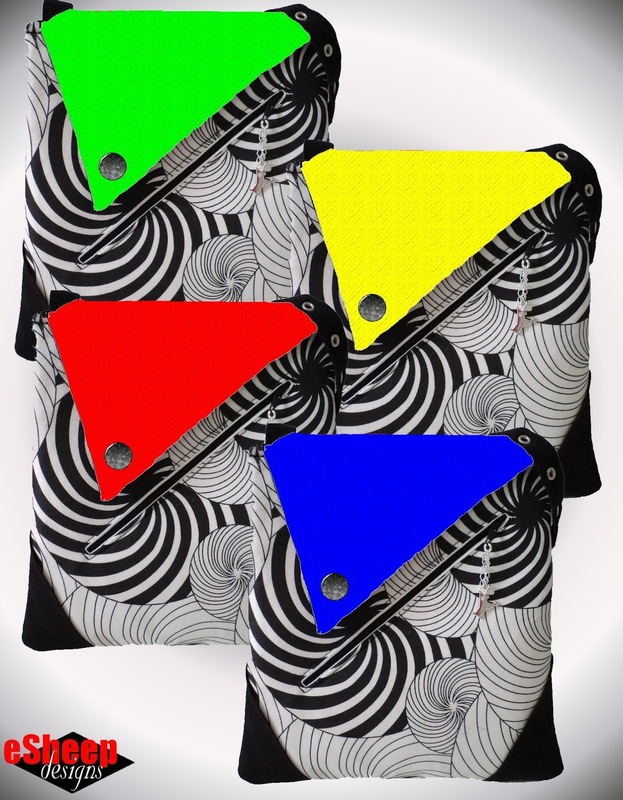 In reality, I think I've only had three people actually inquire about this lack of "an inside" to the Hot Hues bag. To anyone who hasn't asked but is curious, I will say to you the same thing as I said to the last person: once the two pockets of this bag are filled, there is no room for additional contents "in between", unless you adjust the overall size of the bag. Basically, whatever space you think will be gained by having a central opening actually takes away from the space inside the two pockets. That said, once you've bought the pattern, you can make it however you want! I have a soft spot for my Hot Hues bag. Two years on, both my mother and I still use ours. 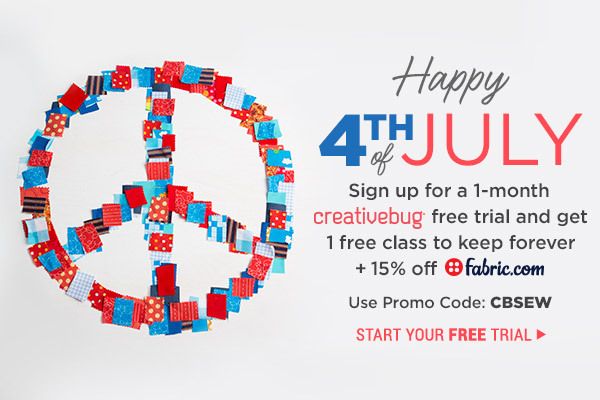 Will end this post with the latest deal from CreativeBug celebrating the 4th of July... join now to get full access to their entire course content for a month (instead of the usual two weeks); plus you'll be entitled to save a free class of your choice and get a 15% off discount at Fabric.com. Not a bad deal, all in all. As per usual with Creativebug, they're not good about providing dates for their promos, so if you want to take advantage, I assume sooner is better than later. Promo code is CBSEW. Sometimes I follow a pattern exactly, sometimes not. Not having all supplies on hand and impulsiveness to sew it right now is one reason for not follow. At other times I change a pattern simply due to personal preference. 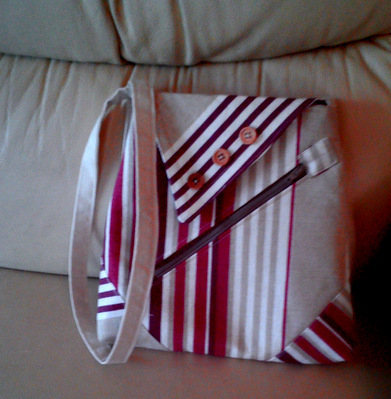 I really like the stripes going in different directions on the first bag! And the black, white, red fabric is gorgeous! Like Pam, I change things because of lack of supplies and to suit my personal preferences too. Other times I change things to be creative, such as adding an applique or making patchwork fabric first and then cutting the pattern out. Sometimes I want to enlarge or reduce a pattern as well. I generally try to make a pattern as written the first time. I do that with recipes too. After that, I often will adjust if I want the next time through. Good for you, Kathy! I try my best to follow instructions for recipes but likely end up changing something most of the time. Thanks for adding your thoughts.